Dr. Allan Oleinick is a graduate of the University of Michigan ‘79 (BS) and Case Western Reserve University School of Dentistry ‘83 (DDS). He performed a 1year General Practice Residency at Sinai Hospital of Detroit, Michigan. During this time he wrote an article titled “ Osseointegration vs Fibro-osseointegration: Review of Endosseous Dental Implant Systems” Published in the General Dentistry journal September-October 1993 edition. This prestigious 1 year post graduate program is one of just a few programs of its kind in the whole country. He practiced for 6 years in Boca Raton, Florida before returning to Metro-Detroit where he has been practicing for 30 years. Dr. Oleinick volunteered at the Free Medical Clinic of Greater Cleveland while in dental school. 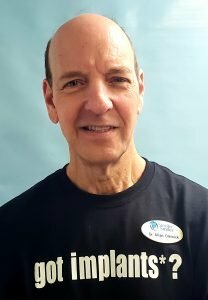 Dr. Oleinick has also spent time as a volunteer for the Alpha Omega free dental clinic in Southfield, Michigan. Additionally, he volunteers with his brother Larry’s non-profit organization Heart 2 Hart Detroit which helps to feed and clothe people of need in the city of Detroit, Michigan. He is very excited to join the Smoler Smiles Team to continue his work helping people live healthy. Dr. Oleinick believes Doctor to patient communication is essential to allow patients to make educated decisions regarding their dental treatment and to achieve the most favorable oral health outcomes. Dr. Oleinick has been happily married to his wife Claire for 33 years and has two wonderful children. In his spare time Dr. Oleinick can be found on a golf course, exercising in the gym, or biking with his wife on one of Michigan’s bike trails. He was once ranked 448th in the world in indoor rowing and has achieved one hole-in-one! He claims his eyes were open when doing so! Designed and Maintained by Advantage Marketing Solutions. All Rights Reserved.